Rich used 2 35lb KB's and went for the entire 8 minutes, completing 51 reps.
Mike P. used 2 26lb KB's completed 40 repetitions. Israel used 2 35lb KB's and completed 40 repetitions. 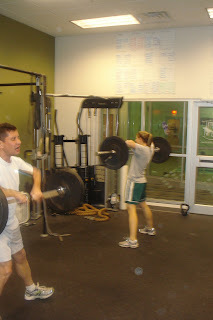 Laura used 2 17lb KB's and also went for the entire 8 minutes and completed 59 reps!